Published: Oct. 2, 2016 at 10:26 p.m. Updated: Oct. 4, 2016 at 11:43 a.m. Opportunity is the name of the game in fantasy football. Talent matters, of course, but we want players who see a healthy volume of targets and touches to anchor our lineups, especially in daily fantasy. Every week in the second season of the Opportunity Report, we'll look at all the passing targets for every NFL team and the percentage each player owns. Franchise will handle the backfield touches section this year and his Week 4 piece is tabbed above. After Week 4 we have even more new data to work with and can dig into the passing distribution for each NFL team. We're trending far more towards the territory where we need to believe what we are seeing in these distributions is the new reality we should adopt. We were looking for this game for the first three weeks of the season and John Brown finally was fully operational. Brown saw double the targets of Larry Fitzgerald and Michael Floyd and played a full complement of snaps (91 percent). He reminded those who forgot he is one of the league's best and most complete route runners and also handled two red zone targets. Fitzgerald, on the other hand, did not garner a target inside the 20-yard line. With Brown at full speed and a host of other receiving options, Fitzgerald's ceiling is still in question despite a strong start to the year. There were some calls by Arizona media for Michael Floyd to lose playing time after a rough first three weeks. Whether that did come to pass or not due to his concussion from Week 3, Floyd played just 45 percent of the team snaps. Jaron Brown, who had a fine summer with the team, played 57 percent. Concerns were mounting that Julio Jones might not see the volume this year to dominate like he did last year after seeing just 20 targets in the first three games. Well that certainly looks a lot less valid after a massive 300-yard thrashing of the Panthers young secondary by Jones. These sort of ridiculous ceiling games are still well-within the range of outcomes of Julio Jones, we should have never doubted that. It's still worth keeping in the back of our mind the lack of volume Jones saw in Weeks 1 to 3 as part of those range of outcomes, especially with a tougher schedule coming down the pike, but let's just take the time to bask in the glow that was one of the most dominant receiving games in recent years. Forgive me, Steve Smith, for I doubted you. The 37-year-old receiver is back at it again, looking ageless for what seems like the 100th year in a row. Smith began to garner more downfield targets in Week 4 as his average depth of target jumped from his three-week average of 7.7 to a 9.0 mark. He's clearly still the apple of Joe Flacco's eye. This was also the highest snap share week for Smith (82 percent) and Mike Wallace (83 percent). The target concentration is becoming more clear here. With Terrance West named the starter and performing well (21-113-TD) with Justin Forsett a healthy scratch, there was room for a passing down back in the pecking order. Fullback Kyle Juszczyk assumed seven targets with that spot open, as team seems uninterested in using Buck Allen (26 percent of the snaps). Rookie Kenneth Dixon could help fill this void when he returns in the next few weeks. Just make sure to keep your expectations realistic, something a number of people seem incapable of doing with Dixon's pending return. Buffalo surprisingly took down the Patriots in Foxboro on Sunday in a game where Tyrod Taylor wasn't dazzling, but efficient and economical in his passing. Robert Woods inherited the bulk of the targets with Sammy Watkins out of the mix. The veteran receiver has a solid target floor with the Bills No. 1 target out of the mix for the foreseeable future. This also an extended audition for Woods, who is a free agent after the year, to potentially garner interest on the open market from a team with more of a high-volume pass attack. He might be someone to sniff around in dynasty formats, especially. In a blowout loss to the Falcons, the passing game never got going to its fullest extent. Cam Newton has struggled in the face of waves of pressure the last two weeks. The reigning MVP has a 34.95 pass rating the last two weeks when facing the blitz (20 pass attempts). The pass catchers are suffering. Greg Olsen was largely blanked from the stat sheet until Derek Anderson took over. Fozzy Whittaker ended up their leading receiver with the quarterbacks needing to check down to avoid the pass rush. Better days will come, but until the protection improves and a crumbling defense can put them back in more favorable game scripts, we need to adjust expectations for this offense. Kevin White led the team in targets for the third week of the season, and the second-year receiver left the game in the third quarter with an injury. Both Jay Cutler and especially Brian Hoyer have reputations as players that lock onto their first read and feed a singularly designed target. In what might be the most surprising development of the fantasy football season, it appears that primary first read is Kevin White, and not Alshon Jeffery for the Bears quarterbacks. Even when White left the game in the third quarter, Jeffery did not record a single target in the second half. Whether due to Alshon Jeffery primarily being a downfield route runner, or a potential conspiracy theory involving the Bears wanting to use him less because they don't have plans for him after his franchise-tagged 2016 season, the first four weeks of the regular season suggest he's not a featured target in this offense. White did go in for an MRI Monday and could miss multiple weeks. That will provide an important test for projecting Jeffery's volume going forward. After a slow game in Week 2 and middling outing in Week 3, A.J. Green busted back out with a massive contest in which he dominated the weak Dolphins cornerbacks. Pushing a 35 percent market share of the passing offense is in line with what we should expect going forward from Green. None of these other pass-catchers can hang onto a predictable outlook with Green dominating the target share on a weekly basis. Both Brandon LaFell and Tyler Boyd will struggle to flirt with 60 yards and have disastrous floors. It was painfully apparent, that the Bengals did miss the red zone presence that Tyler Eifert provides. A.J. Green broke a Tony Lippett tackle attempt to sneak in a red zone score, but otherwise struggled to finish inside the 20-yard line. It was good to see Terrelle Pryor as the engine of the Browns offense once again. Pryor beat Josh Norman a few times to create separation today, including on his red zone touchdown. He is a legitimate wide receiver at this point, and he should see eight-plus targets in every game until Corey Coleman returns. With Cody Kessler behind center, no other pass-catcher has much value, including Gary Barnidge who is no more than a streaming-level tight end. Without Dez Bryant, Brice Butler stepped up to fill a bigger role, tying for the team lead in targets. Butler has the frame of a top wideout at 6-foot-3 and over 200 pounds while demonstrating solid play speed. He's a sleeper to watch if Dez Bryant misses more time. It was good to see Dak Prescott distribute the ball to both Butler and Terrance Williams after he was widely expected to just lock into Jason Witten and Cole Beasley. Even when Trevor Siemian went down in the late second quarter and rookie Paxton Lynch came into the game, Emmanuel Sanders remained the No. 1 receiver. Sanders had six targets in the second half from Lynch to just four for Thomas, and accumulated 33 yards and a touchdown. Lynch also brings more of a downfield element to the Broncos offense, even after Siemian showed progress as a deep thrower in Week 3. Lynch's 13.4 average depth of aimed throw dwarfed Siemain's 7.6 average for the season. Gary Kubiak seemed to intimate Monday morning that Siemian would be the starter if he's cleared to play in Week 5. Either way, both Thomas and Sanders are viable plays with the concentration of targets and better than expected play under center in Denver. Sanders is the top player in town though, as he now has 42 targets to 26 for Thomas. Golden Tate's downward trend continued in spectacular fashion with a one-catch for one-yard floundering in Week 4. It appeared his playing time got cut after Matthew Stafford was visibly upset when Tate kept streaking downfield on an interception where it seemed the quarterback expected something different from him. Jim Caldwell continues insisting he did not bench the veteran receiver. However, Tate played just 59 percent of the snaps, where Anquan Boldin played 88 percent and Andre Roberts mixed in with a season-high 44 percent. Going forward, we should project something to change with Golden Tate's roll when it actually does. Will Fuller got back on track in this spot, but the same could not be said for DeAndre Hopkins. There was always concern with Hopkins repeating his stats from last year. Not only is it clear that the Texans have a legit high-end No. 2 in Fuller, who the quarterback clearly likes throwing to, but there are other options that get worked in. This is the second week in a row where tight ends garnered a sizable portion of the market share. Jaelen Strong played 51 percent of the snaps and tied for second on the team in targets. The Texans also ran just 65 plays in a game they were never trailed in and fed 19 carries to their feature back. None of that matches the condition of the first half of 2015 where Hopkins racked up 66 catches and 870 yards on 111 targets. Without question, Hopkins is so talented that he will have his weeks. Yet, his volume is nowhere near as locked-in as it was last season. Adjust accordingly. The Colts offense is broken and talent deficient. The loss of Donte Moncrief loomed large in this game as no pass-catcher outside of T.Y. Hilton made a consistent impact on Sunday. The Colts two tight end sets took a back seat today after being more of a staple in Week 3. The Colts played 11 personnel on 50 plays and 12 personnel on 16 plays. We badly need to adjust expectations going forward for this offense, including Andrew Luck. There just isn't enough talent here. 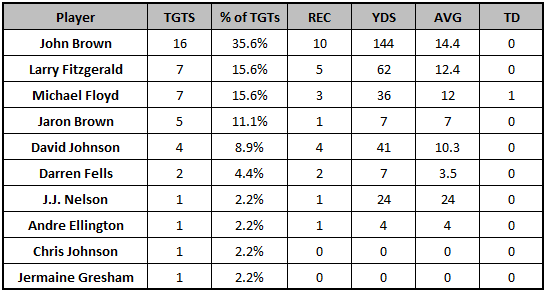 Allen Robinson is still the target hog of this this offense, garnering just over 30 percent of the team targets including several red zone looks. There was a bigger game to be had here, but the Colts committed multiple pass interference penalties on Robinson and he misplayed an end zone target. Allen Hurns still isn't seeing enough volume, accumulating almost all of his production on a long 42-yard catch and run touchdown. 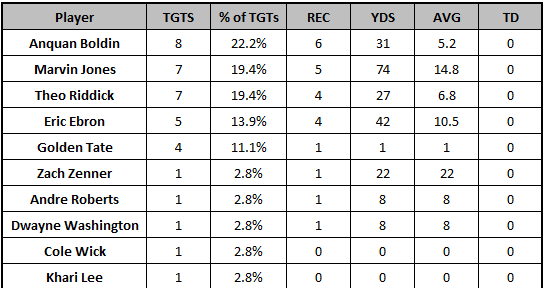 Hurns (89 percent) played more snaps than Marqise Lee (71 percent) but they are beginning to cannibalize each other. In a blowout loss, we can probably just take this distribution and just throw it out. Players like Albert Wilson and Tyreek Hill who are rarely regulars in the distribution showed up with eight and seven targets. One thing to notice, however, is in the two games where the Chiefs were forced to give chase (Weeks 1 and 4), uber-athlete Chris Conley showed off his talent. He saw 13 targets in those two games, catching 10 of them for 113 yards. Brian Quick now has three touchdowns in two games. Is it finally happening? Quick didn't have a strong summer and was not a starter entering the season. He started strong way back in 2014 before a serious shoulder injury almost ended his career and clearly hindered him in 2015. He's at least worth a speculative add to see if he becomes more of a featured part of the passing rotation. He's only played 55 and 54 percent of the snaps the last two weeks and had just eight targets despite scoring three times. The Dolphins offense was nothing short of poor on Thursday night. With a number of offensive line breakdowns hurrying Ryan Tannehill, he once again defaulted to just checking down to Jarvis Landry. Outside of Kenny Stills' one long touchdown catch, the Dolphins could do little down the field. DeVante Parker disappeared in this spot, after touchdowns in back-to-back games. He's still too inconsistent to count on as a week-to-week difference maker. We expected this to be a slow defensive game where most fantasy players didn't go nuts. As such, it would seem odd to freak out about Beckham or Stefon Diggs' slow numbers. Kyle Rudolph continues to make good on his rebirthing season with Sam Bradford at the helm and he's fourth in the NFL in red zone targets among tight ends. Cordarrelle Patterson saw six targets, the most he's seen in any game since November 2nd, 2014. He played 49 percent of the snaps, well ahead of Charles Johnson who played on 29 percent. Might they finally be incorporating him into the offense in a gadget type role?? Fantasy players will never forgive Cordarrelle Patterson for "burning them" (get over yourself, people) but that would be fun to watch. New England threw just 27 passes in this game including a mere three in the first half so there was not much volume to be had. Through his first two games back, Rob Gronkowski has just one reception. Before we go into full-on panic mode, ESPN's Mike Reiss provided an explanation stating that in 41 total snaps, Gronkowski ran just 13 routes Sunday. The Patriots likely did not feel the need to work Gronkowski too hard while coming back from his hamstring injury. Expect that to change with Tom Brady coming back in Week 5. Brandin Cooks went off in Week 1 for six catches, 143 yards and two touchdowns on nine targets. Since then he has just 12 catches, 112 yards and no scores on 23 targets. Cooks has just one more target than Michael Thomas on the season, who shined in each of the last two games, to hold a team high 32. This is who Brandin Cooks is. He's a dangerous deep threat and big play maven, but he doesn't defeat top coverage (Desmond Trufant and Jason Verrett the last two weeks) and has dramatic home/road splits. All of this dates back to last season. He's once again on pace for just shy of 130 targets, not quite what you want out of a player many consider a clear WR1. He will absolutely have his games, but you need to expect peaks and valleys. Willie Snead returned to see just one target while playing 68 percent of the snaps. Michael Thomas played more snaps than both Snead and Cooks (69 percent), going out on 76 percent of the team's plays. The Saints return from a bye in Week 6 to play the Panthers, so there will be ample time for Snead to get right. As Footballguys' writer Adam Harstad points out, Odell Beckham has 22 catches for 303 yards this season. He started 2015 with 24 catches 307 yards and two touchdowns. The only difference is he hasn't scored. It's wild what a slave to touchdowns are perception truly is. Beckham is on pace for 156 targets and has 25.7% of the team targets. He's fine, just hasn't scored yet and given that there are only five players in NFL history with more receiving scores in their first 32 games, we know that is coming. Eric Decker sidelined Brandon Marshall and Quincy Enunwa clearly led the way in targets among the Jets pass-catchers. Marshall looked healthy after a rocky Week 3 coming off a Week 2 knee injury. He'll be a target monster, and likely push double-digit targets, every week that Decker is sidelined. Enunwa also offers a solid floor. Bilal Powell re-emerged as a passing game threat and showed off his ability in space averaging nine yards per reception. The veteran back could be sitting on a big workload after Matt Forte left this game early with an injury. 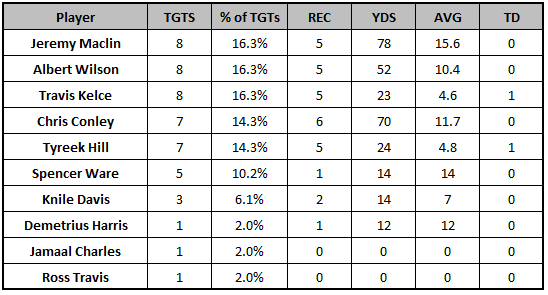 Michael Crabtree has now retaken the target leader spot from Amari Cooper, something he held last year as well. The veteran receiver is still a complete baller, dominating the inferior Ravens' cornerbacks on Sunday. We've spoken about Seth Roberts more than a few times in this space, and he was once a factor in Week 4 in snaring his third red zone touchdown of the season. He leads the team with five red zone targets and Crabtree is second with three, all of which he's turned into touchdowns. Amari Cooper, on the other hand has yet to record a catch inside the 20-yard line. The 2015 fourth overall pick had just seven targets in the red zone and zero inside the 10-yard line as a rookie. At this point, Cooper's lack of involvement is inching dangerously close to "a trend" territory. We'll see if this changes going forward or if this is just the way it is for Cooper. Everything worked for the Steelers on Sunday night. They stayed true to their word on their usage of Le'Veon Bell as he lined up in the backfield on just 75 percent of his snaps. The team deployed him in the slot on 15 percent of his plays, out wide on four percent and even tight to line on one play. His usage in the passing game will put a damper on the volume of bit receivers like Markus Wheaton, Eli Rogers (when healthy) and Sammie Coates. With that being said, this was Coates' most consistent outing to date in 2016. His average depth of target was just 13.4, down from his season average of 27.2, showing a more complete skill set. His development will be a huge storyline to monitor for the Pittsburgh offense going forward. Dontrelle Inman had long led the Chargers in wide receiver snaps after Keenan Allen went down. He turned that into production in Week 4 against a deficient secondary as Tyrell Williams, who left the game for a stretch with an injury, and Travis Benjamin disappointed. Hunter Henry looks like a more than capable replacement for Antonio Gates down the line and may even be an upgrade at this moment in their careers. The volume in this offense is just too unpredictable. Jeremy Kerley re-emerged after going quiet with five catches for 53 yards on 11 targets in Weeks 2 and 3 following his strong 11 target Week 1 debut. The Cowboys top slot corner Orlando Scandrick was out for this game and that was a weak point in the Rams defense in the first week of the season. Perhaps you can use that individual schematic matchup to try and decipher when to expect much from Kerley. 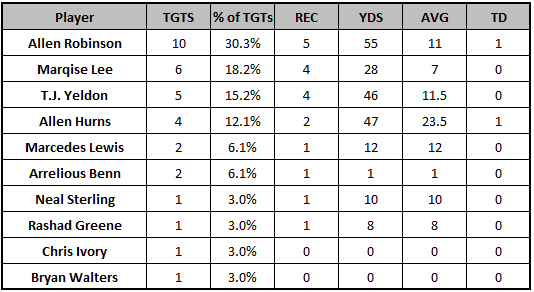 Doug Baldwin did suffer an injury in a portion of this game, but it was still great to see Jimmy Graham lead the team in targets. He and Russell Wilson look to be dialed in right now, with the quarterback trusting his big tight end in contested catch situations. If his health is intact, we've now seen enough to declare Jimmy Graham back to form. 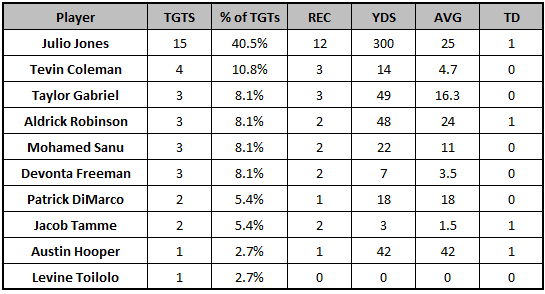 Tyler Lockett continues to play the snap share (26 percent) of a depth player. He was on the injury report once again this week, and perhaps that is limiting him. Either way, he will struggle for requisite targets to be fantasy viable with Graham re-established as a top-level threat. The Broncos completely erased any potential offense for the Buccaneers, but their target distribution remained as expected. If anything, Cameron Brate further established himself as the primary tight end, playing on a whopping 86 percent of the snaps. Vincent Jackson did not lose any playing time (89 percent of the snaps) despite his lackluster play thus far in 2016. Rishard Matthews led the team with 82 yards, but saw just two targets. Tajae Sharpe played 90 percent of the snaps, but no other wide receiver played on more than 54 percent (Andre Johnson). 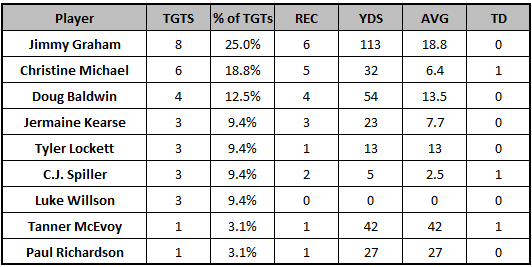 Even Delanie Walker racked up just two catches on eight targets. He's still not fully healthy, it seems, as he played on just 55 percent of the snaps. Washington finally got the ball to their best red zone player, and just like that Jordan Reed hauled in two scores inside the 20-yard line. It doesn't have to be so hard. After a strong start to the season, Jamison Crowder mysteriously was a non-factor in this game. Crowder saw fewer targets (three) and the lowest snap share (54 percent) than he had in any game prior to Week 4. Washington mostly controlled this game after the early touchdowns, and didn't need to lean on the passing game. We've already seen from their early season work this sort of game script will be the outlier.